Gov. Mark Dayton plans to sign the Vikings stadium bill at a noon ceremony Monday, kicking off a construction process that could last four years, or possibly more. But there's a lot of homework to be done before the shovels start turning in downtown Minneapolis. "The general schedule that has been laid with this project is that we would start in earnest in the second and third quarter of 2013," said Ken Sorenson, vice president at Mortenson Construction, speaking at a recent state Senate Jobs and Economic Growth committee hearing. Mortenson built Target Field and TCF Bank Stadium, and is a likely prospect to build the Vikings' new home. He was predicting what might happen if his firm were selected for the project. "We could be on site early next year, to start relocating utilities, to start accommodating some of the back of house restructuring that needs to be done for the Metrodome," he said. More than 700 construction trades people would be on the site on a typical day -- with a peak of about 1,800. But even before a contractor is chosen, the stadium has one more vote to win: The Minneapolis City Council will have to sign off on the tax shift that funds the city's $150 million share of the project's financing, as well as $7.5 million in annual upkeep. The council approved the deal in a 7 to 6 preliminary vote last month. But 9th Ward council member Gary Schiff says he's still against it. "The city council is being given a take it or leave it package, and we have not been allowed to negotiate any of the details, and I think that is probably the worse part of all. There's no room for anybody to stand up and advocate for a better deal for city taxpayers," he said. 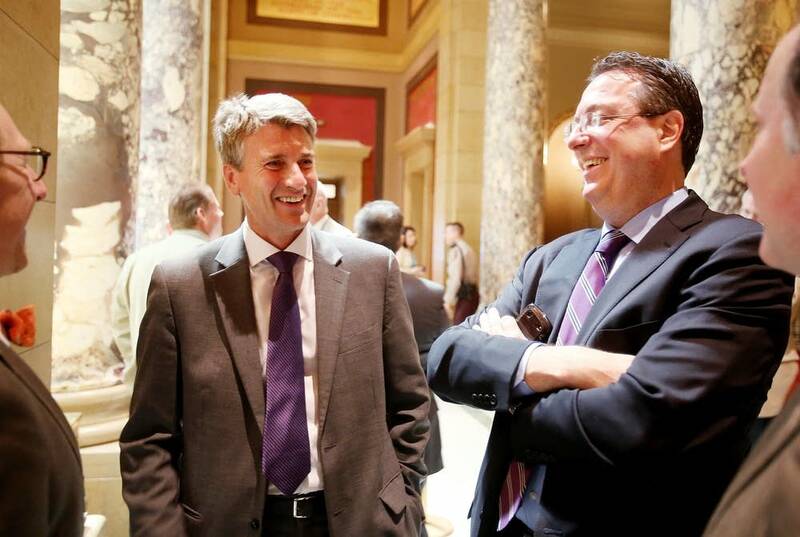 Minneapolis Mayor R.T. Rybak said a full council vote is likely May 25, although it could be earlier. The legislation passed at the Capitol last week to finance the stadium also calls for the end of the Metropolitan Sports Facility Commission and the creation of a new agency, the Minnesota Sports Facilities Authority. The governor will have to appoint four members and a chair and Rybak will fill two spots. They're the seven that will actually sign off on the stadium and oversee construction. The University of Minnesota also has to get to work. TCF Bank stadium is expected to host the Vikings for at least one season, although an initial agreement reached with the university and the team contains the option for the Vikings to play there longer if construction or other circumstances require. According to the preliminary agreement, the university might take in as much as $3 million per season in rent, concessions and other earnings. The team is also expected to pay for upgrades the U's football stadium, including a heated field. Kathleen O'Brien, vice president for university services, says that while the Vikings' stay may be temporary, the improvements will have a lasting impact. "The University can use the stadium a little longer into the year, and if we have some of those really cold and snowy Novembers," she said. Minnesota's charitable gambling industry will also be getting an upgrade, with nearly $2 billion in expected new sales, after the state decided to pay its share of the new NFL stadium's cost with taxes on electronic pull tab gambling and bingo -- the first major gambling expansion since the Minnesota State Lottery started in 1990. Gary Danger is compliance officer with the state's Gambling Control Board, the agency that will be setting up the new games from the ground up. The board will have to license manufacturers, set up a regulatory system -- and even send the machines to "gambling labs" to make sure they work right -- and aren't just illegal slot machines in disguise. "There will be pressure of course, to try to get things running as soon as possible. And the concern the board's going to have is to make sure things are done correctly and fairly," he said. More details are expected to be laid out by state and local officials this week -- if all goes according to plan the first NFL kickoff in the as yet unnamed stadium happens in 2016.